February 21, 2014, 9:00 a.m. ACCIDENTS WITHOUT INJURY: If no one is hurt and the vehicles are driveable, please file a report at the PD 825 Burlington Ave.
A Dense Fog Advisory is in effect until 7:00 p.m, which may effect rush hour travel and reduce visibility. Please drive slow, carefully, and do not use your high beams. A High Wind Warning is in effect today from 5:00 p.m. until 11:00 p.m CST. Tonight's chance of precipitation is 70% with rain changing to snow in the early morning hours as temperatures drop to the high to mid 20s between 4:00 a.m and 7:00 a.m. Friday. Staff is prepared for the weather with plowing/salting operations to be deployed as weather conditions dictate. Crews continue to monitor and clear storm drains. Make sure downspouts are free of any ice. 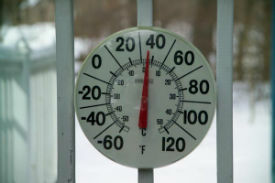 Make sure your sump pump is ice free and is able to discharge without any restrictions/obstructions. Check the battery on your back up sump pump to make sure it is properly charged. 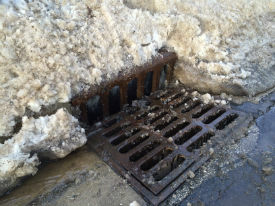 Clear the storm sewer drains near your property, if you're physically able to do so. Call Public Works at 630-434-5460 if you notice excessive water pooling on the roadway. CALL COMED if you spot a downed power line/live wire. In the event of high winds causing tree damage, the Village is responsible for the clean up and removal of fallen branches and debris from trees located in Village parkways. The removal of branches and debris which comes from private trees and vegetation is the responsibility of the property owner.